Appalachian Trail has several access points within Towns County, below are 3 of these, along with information and GPS locations. You can say that the Appalachian Trail either begins or ends in the Blue Ridge Mountains of North Georgia depending on where one begins their journey. Stretching over 2,100-miles from Georgia’s Springer Mountain to Mount Katahdin in Maine, the Appalachian Trail is world-renowned to serious hikers and backpackers as well as day hikers looking for fresh air, exercise and majestic views. The trail’s grand vision began in 1921 by forester, regional planner and conservationist Benton MacKaye, and completed in the Georgia region in 1931. A section of the trail’s most outstanding views stretch across the southern regions of Towns County offering hikers the opportunity for a causal day’s stroll or overnight campouts for backpackers looking to escape the world below for an experience to remember in the natural world. Available on this Highlander Mobi are three GPS locations where hikers can access the Appalachian Trail in southern Towns County Georgia. Two of these locations are at Unicoi Gap and Dicks Creek Gap where hikers will find convenient parking for immediate access to the trail. 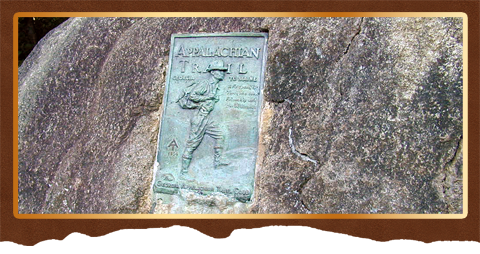 One other access point to the to the Appalachian Trail is via a hike along a section of Jack’s Knob Trail which hikers can pick up just across the roadway to the entrance to Brasstown Bald and Wilderness Area. There’s a parking area near the entrance to Brasstown Bald for hikers to use. There are other trails in southern Towns County that can access the Appalachian Trail not contained in the Highlander Mobi GPS sightings. We hope to make these available to hikers at a future date. Inexperience hikers as well as experienced hikers should never hike alone. It’s highly recommended to bring along a companion, drinking water and some energy bars or other manageable snacks. As a courtesy always pack out what you bring in and leave the least amount of footprint (human impression) as possible allowing others to enjoy the same unique experience as you have. Unicoi Gap is located along GA 75/2 high above the far southern reaches of Towns County. This is a perfect access point for day hikers or overnight backpackers looking to experience the wonders and beauty of the southern Blue Ridge Mountains along the renowned Appalachian Trail. Whether your looking for a backpacking trip across the mountain tops, a days hiking tour or just a quick one-hour in and out experience along the Appalachian Trail its well worth the journey and the claim that you also hiked the infamous trail. Dicks Gap is located along highway GA 76/2 high above the far eastern reaches of Towns County and is a perfect access point for day hikers or overnight backpackers looking to experience the wonders and beauty of the southern Blue Ridge Mountain’s along the renowned Appalachian Trail. The spacious parking area and access to the trail at Dicks Creek Gap is located on the northern side of highway. One of the more notable features at the access point to the Appalachian Trail is its tranquil beauty set within a hardwood forest. This trail access site also offers a couple of kiosks providing hikers with necessary information for their journey. Also located at the site are several picnic tables for hikers or folks that are just looking for a roadside setting in a peaceful and beautiful environment. The leaf color here during the autumn is exceptional. Whether your looking for a backpacking trip across the mountain tops, a days hiking tour or just a quick one-hour in and out experience along the Appalachian Trail its well worth the journey. Like many highway access points to the Appalachian Trail there is a large boulder at the trailhead with the trail access name and compass directions carved into a large boulder. It’s a good spot for a personalized photo opportunity before setting out on the trail. Located along GA180 adjacent to the entrance to Brasstown Bald is the halfway point along Jack’s Knob Trail that begins atop of Brasstown Bald and concludes at the Appalachian Trail at Chattahoochee Gap approximately 2-miles to the south of GA 180. Jack’s Knob Trail is rated moderate to strenuous. Though the trail is conveniently located across from the entrance to Brasstown Bald it is a little difficult to see at first. The trail beings on the south side of GA180 and instead of boldly opening into the woods the trail runs parallel along the roadway before turning south, a marker is near the entrance to the trail visible when looking westward. From this access point that leads to the Appalachian Trail, Jack’s Knob Trail begins as a long ascent before reaching a descent along a ridge trail before reaching a second ascent to the Appalachian Trail above. There is a convenient parking area next to the entrance to the Brasstown Bald and Wilderness Area for hikers.